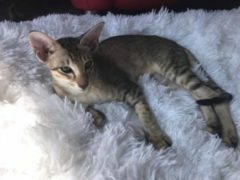 Seal Lynx Oriental kitten looking for her forever home. She is 15 weeks old, desexed, microchipped, vaccinated, registered all up to date with current worming and flea treatments. DOB 3rd Dec 2018. From a litter of 5, house raised. She’s ready for action, would prefer a house with another cat. I am based in Auckland and like to meet my pet owners, so it needs to be possible to come and meet us. She’ll have a bag of toys n goodies to take with her.